Moshood Abiola Polytechnic, Abeokuta, MAPOLY Registration and Admission Clearance Schedule and Requirements for all Fresh / Newly Admitted Students for 2018/2019 Academic Session. 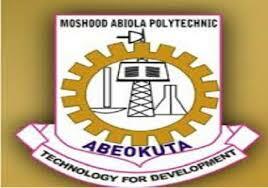 The Management of Moshood Abiola Polytechnic, Abeokuta, Ogun State (MAPOLY) wishes to inform all candidates who have been offered provisional admission for National Diploma Programme at Ogun State Polytechnic, Ipokia and Higher National Diploma programme at Moshood Abiola Polytechnic, Abeokuta that the should accept their offer of admission and proceed to their School Offices to commence their full registration as from Monday, 7th January, 2019. Below are the List of Documents should make available during the clearance signing. Passport (30copies or more). Note; u must use same passport. Transcript for HND student that did not do their OND in MAPOLY.